Armadillos are timid, armored mammals that live in warm grasslands and forests from South America up to the southern United States. Armadillo is a Spanish word meaning "little armored one" and refers to the bony plates that cover the back, head, legs, and tail of most of these odd looking creatures. Armadillos generally have a pointy or shovel-shaped snout and small eyes. Many can curl into a ball when threatened by predators. Armadillos are burrowers who dig underground dens. Armadillos can jump 3 feet straight up into the air. 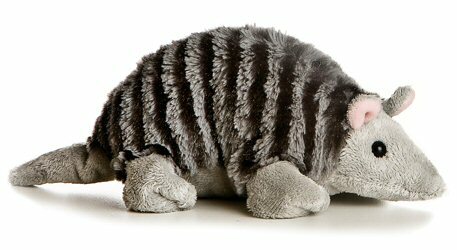 There 20 different types of armadillos that range in size from 6 to 60 inches long. Armadillos are primarily insect-eaters. Meerkat II is an adorable plush meerkat with soft light brown fur, cream tummy and face, and sweet brown eyes.